For directions to the arena click here. 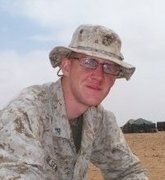 My Eagle project is a memorial to Marine Lance Corporal Nigel K. Olsen, a Salem resident who was killed in action in Afghanistan on March 4th of this year. The memorial is in the form of a much needed flagpole at Salem rodeo arena. The monument is located on the northwest corner of the arena. Contact me with any comments. My contact information is available on the project home page (link above). Thanks to all of the people who have helped me with this project. Marine Lance Cpl. Nigel K. Olsen, 21, of Orem, Utah, assigned to the 4th Light Armored Reconnaissance Battalion, 4th Marine Division, Marine Forces Reserve, Camp Pendleton, Calif.; died March 4, 2010 in Helmand province, Afghanistan, while supporting combat operations. Olsen's death comes two days after the death on another Marine from the Camp Williams-based Charlie Company of the 4th Light Armored Reconnaissance Battalion. Carlos Aragon, 19, of Orem was on a foot patrol when he stepped on a pressure-activated homemade explosive. The two Marines had been students together at Mountain View High School in Orem, where Olsen graduated in 2007 and Aragon graduated in 2009, according to the two Marines' social networking pages. "The picture of the 6-year-old boy on the beach standing at attention and giving the camera a smart salute tells you everything you need to know about Lance Cpl. Nigel K. Olsen," said his sister, Stacy Hansen. "At the age of 3, he knew what he wanted to do," Hansen said. "He wanted to serve his country." Hansen said her brother joined the Marine Reserve after his high school graduation, but his interest in the military was a lifelong passion. "He would run around the neighborhood in his camos, playing war with the neighborhood kids," she said. "He was a great brother." During a recent telephone call, Hansen said Olsen had complained about not being as involved in some of the fighting as he would have liked. "The last time my mom talked to him, he was upset because they were not able to be in a gunbattle," she said. "They ended up being in the thick of it." In his spare time, he liked playing Xbox and spending time with his family. "He loved Sunday dinners at my mom's house and playing with all of his nieces and nephews," she said.